The baby, mother and father were in the holiday resort of Penang, northern Malaysia, when the tsunami struck. She was just 20 days old. The powerful waters that surged through the building swept her father and mother away with no idea what had happened to their defenceless child. Annal Mary kisses her 20-day-old baby Suppiah Tulasi, who survived the weekend tsunamis at her restaurant in Penang resort island, northwestern Malaysia, on December 29, 2004. President George W. Bush yesterday ordered the US flag to be flown at half-staff for five days to honour victims of the Indian Ocean tsunami as a White House delegation prepared to visit devastated areas. Thailand yesterday offered financial aid to help rebuild one of its most important tourist destinations, but hotel operators said it could take two years to repair the tsunami damage. Heavy rains and fresh floods disrupted aid deliveries to Asia’s tsunami-hit villages today, just as a global $ 2 billion relief operation started to kick in a week after walls of water left millions struggling to survive. Pictures of a Swedish mother dashing into tidal waves to save her children inspired faith in the human spirit when facing disaster as they continued to be shown in media around the world today. Former Cambodian King Norodom Sihanouk says an astrologer warned him that an “ultra-catastrophic cataclysm” would strike, but that his country would be spared if proper rituals were conducted. Opposition parties on Saturday staged rallies across the country against President Pervez Musharraf’s decision not to quit the post of army chief as he had promised to the nation in 2003. Lima, January 2 Peru declared a state of emergency in the southern Andean town of Andahuaylas where an armed group led by a radical former soldier stormed a police station and was holding 10 officers hostage. Maoist rebels have killed 17 security personnel and injured 18 others in two separate attacks, official sources said today. Five policemen were killed when Maoists attacked their vehicle with guns and explosives at Bangaun village in Kanchanpur district bordering India, early today, the police said. Six other policemen sustained injures in the attack. A 16-year-old girl has been detained by the Israeli police in connection with a graffiti appearing in the centre of the city, threatening Prime Minister Ariel Sharon with assassination. Peter Cook was picked today as the world’s most talented comedian in a poll of more than 300 comics, comedy writers, producers and directors on both sides of the Atlantic. The British comedian, who first rose to fame in the satirical show “Beyond The Fringe,” took the title ahead of “Monty Python” star John Cleese. The mother Louise Willgrass, 43, was on her way to the beach in Phuket, Thailand, when she popped into a supermarket to buy suncream. Her husband, Nigel, also 43, and their four children stayed in the car. They never saw Louise alive again. When the tidal wave struck their car, Mr Willgrass and the children — aged between six and 16 — escaped and stayed afloat by holding on to debris. Despite the devastation all around them the children kept their heads. “They were all calm, a bit scared, but they didn’t complain or panic - they were so brave.” Mr Willgrass, from Colney near Norwich, later found his wife’s body among many in the morgue. The fisherman Raja Shekar lost his home, his family’s possessions, his life savings in cash, his livelihood and his sister. “I was working on my nets on the shore,” said the fisherman from Kanaga Chettkuluan, a village on the eastern coast of India. “We saw the water coming and I ran with my sister back to the house. The water came and it just dragged her back out. By then the water level was above the door.” His neighbours ran for higher ground but Mr Shekar stayed. “I searched three hours for my sister, but I couldn’t find her. Nobody else was here, everybody had run. I should have run too but I wanted to find her.” When the water had gone, leaving smashed wood and foliage all around, he found her body 60 feet from the house. Saraga, 20, was buried with a dozen others from the beach, without the usual Hindu rituals. One of the dead was three years old. She had slipped from her father’s grasp as they ran. The rescuer Jo-Anne Wau ran for her life as the waters rose on the island of Nias, off the Sumatran coast. The British-born woman urged children to join her on higher ground, but one little girl, Malarti, 10, fell and was being sucked down a drain until Mrs Wau, 27, managed to grab her by the hair to stop her disappearing. She held the screaming child until help arrived. “I don’t think she would want to be singled out for praise,” said Mrs Wau’s mother, Annette Windle, from Sheffield, who spoke to her daughter on the phone afterwards. “There were incredible things happening.” Mrs Wau has lived on Nias for four years and married a local man in October. The exiles Moulana Mazahir, who lives in Harrow, north London, lost more than 50 relatives when the wall of water swept through his home town of Hambantota, a resort in southern Sri Lanka. The teenager Meghna Rajshekhar, 13, survived for two days in the water by clinging on to a floating door, while the island she lived on was devastated. The daughter of an officer in the Indian air force was found walking on a beach, dazed, after being washed back to shore on the island of Car Nicobar in the Andaman Sea. Her mother and father had been killed along with 7,100 others when the tsunami destroyed an air base and settlements on the island. She shouted out when helicopters came overhead looking for survivors, but was not heard or seen. Meghna was heavily bruised but hopeful, as she knew she was drifting towards shore. The commander of the air base, V.V. Bandhopadhyay, said her survival was “a miracle in the midst of the disaster the tsunami wreaked”. The cricketers At nine in the morning, two teams were playing cricket on an idyllic pitch in Cuddalore, on the coast of southern India. Moments later, without warning, the mighty wave carried boats, cars and the remains of smashed houses through the air and across the playing field, sweeping away every one of the sportsmen. “We saw the cricket people running forward; the waves were following them and attacked them,” said Ajit, nine. “The waves went out 15 seconds later and we didn’t see any of the cricketers in the water. I saw an auto-rickshaw rolling in the water and a car floating past us.” Ajit heard a neighbour shout “run” and he did so, with his younger brother. He did not look round, so did not see his neighbour covered by the wave. A day after he raised the US tsunami aid contribution tenfold to $ 350 million amid pressure from critics, Bush used his weekly radio address to emphasise the need for private relief donations to a region where giant waves killed nearly 1,27,000 persons and left 5 million homeless. “The carnage is of a scale that defies comprehension,” said Bush, who announced that $ 15 million of US aid has now been disbursed to relief organisations in the area. Secretary of State Colin Powell and the President’s brother, Florida Governor Jeb Bush, were due to leave for the tsunami-devastated region today as part of a delegation assigned to assess the need for further US assistance. An administration official who requested anonymity said yesterday the $ 350 million contribution would come from the government’s main disaster and famine assistance account. The account, managed by the US Agency for International Development, received 384.9 million dollar in funding for relief projects for the current fiscal year. Japan eclipsed the US contribution yesterday by pledging $ 500 million in aid. Finance Minister Somkid Jatusripitak promised tax breaks and soft loans to operators of hotels destroyed or damaged along Thailand’s southwestern beaches, transformed from picture postcard to a scene of death and destruction by last Sunday’s wave. “We have provided them with lending packages and also tax breaks,” Jatusripitak told reporters after meeting about a dozen hotel operators at a restaurant near Khao Lak, a tourist mecca that was virtually wiped out in the disaster. More than 3,000 persons, roughly half foreign tourists, have died in and around Khao Lak, which was especially popular with Scandinavian tourists and, together with nearby Phuket island, was a golden goose for Thailand’s tourism industry. Jatusripitak said the government would allow hotel operators to claim tsunami losses against tax and would ensure state-owned banks gave them credit to help rebuild. He declined to give an overall estimate of the damage Thailand has suffered. Tropical rains in Indonesia’s northern Aceh province, with more than half of the 1,27,000 known dead, halted some aid deliveries. Rescuers are already struggling to cope with the logistical nightmare of reaching devastated villages cut off from the world. “Further flooding caused by heavy rains in some areas is hampering the relief effort and exacerbating poor sanitary conditions of those displaced,” the United Nations said in its latest report on the tsunami relief operation. In Aceh, US and Australian military helicopters buzzed over flattened villages on Sumatra’s cut-off west coast delivering small parcels of aid, but the UN said some remote villages may not receive help for a couple of weeks. “We are relying on the helicopter system because that is the only way we can reach the most remote areas,” Michael Elmquist, head of the UN disaster relief operation in Indonesia, said. “It is probably going to take a couple of weeks before a road network is restored,” Elmquist said. But the tropical rains also delivered relief to survivors, desperate for clean water to avoid diseases such as cholera. UN Secretary-General Kofi Annan said the relief operation was the biggest the UN had ever faced and the reconstruction process would probably take five to 10 years. “Because the devastation is enormous it will require billions of dollars,” Annan said in an interview to ABC’s “This Week”. Annan is due to visit Indonesia on Thursday, where he will probably issue a planned world appeal for more relief at a Jakarta conference on tsunami aid with world leaders. The aid jam was worst at Banda Aceh, the Aceh provincial capital. The UN urged donors to use road transport from Medan to the south, but trucks could take up to 16 hours to reach the devastated city. The arrival of the U S aircraft carrier Abraham Lincoln, now anchored off Aceh, significantly boosted aid operations. Colombo: Officials in the eastern district of Ampara, 350 kilometres east of here, said rains had ceased and flood waters were receding today, but they feared an outbreak of water-borne disease at overcrowded shelters. Ampara was the worst hit in last week’s tsunamis which devastated more than three quarters of the island’s coastline. They suffered a double blow when rains on Saturday dumped some 330 mm of water, triggering a new wave of refugees. Karin Svaerd (37) was photographed a week ago in a series of heart-rending photographs as she daringly sprinted into the waves in a desperate bid to save her family while on holiday in Thailand. Her identity, and her family’s fate, remained unknown until this weekend when she came forward to say they had all survived. “She has become the whole world’s heroine,” said tabloid Expressen today. The series of three pictures shows confused vacationers on the Ray Leh Beach in Krabi looking at the water receding prior to the tsunami. Another shot shows swimmers running in to shore once they saw the wall of water approaching. But Karin Svaerd, unlike everyone else in the picture, was running out toward the wave in a determined bid to reach her family. “I was yelling at them to run, but they couldn’t hear me,” Karin told the daily, describing her desperation as her family snorkelled in the water, unaware of the looming danger. “I could hear people shouting at me ‘Get off the beach’ as I ran past them — but I ignored them,” UK daily News of the World quoted Karin as saying. Karin saw the white wall of water coming towards her, faster and faster. “I did not care. I was looking at my children. I wanted to hold them and care for them,” she told the daily. The family got caught in the tsunamis and was tossed around under water. But one by one they managed to get to their feet and make it to higher ground. An hour after the first wave hit, the family members, including Svaerd’s husband and sister who were sunbathing on the beach, managed to locate each other. “It is impossible to describe the feeling that we all survived with just a few scratches,” Svaerd said. Anton and Filip were hurled among the beach bungalows, their father landed in a swimming pool, while Karin somehow got hold of a tree trunk. “When the next wave came, I could hardly hold on any more. The water climbed over my head. Then came more waves, and with them lots of deck chairs from the pool area,” she told the paper. But after an hour, the whole extended family who had been holidaying together was reunited — alive. “My wife and I decided to spend several thousand dollars to organise these ceremonies so our country and people could be spared such a catastrophe,” Sihanouk, who abdicated last year, wrote on his web site at www.sihanouknorodom. Cambodia was unscathed by the 10-metre (30-foot) tsunamis generated by a December 26 earthquake measured at magnitude 9.0 under the sea off Indonesia’s Sumatra island. 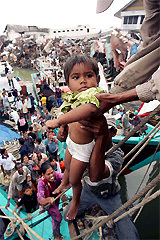 The giant waves rolled across the Indian Ocean killing more than 126,000 persons. The rallies were held in major cities and towns across the country in response to MMA’s call, fully supported by the ARD, to the people to observe a peaceful “black day” to protest against General Musharraf’s move. Speaking to participants of the rallies, ARD and MMA leaders denounced President Musharraf for violating his pledge to give up his army uniform by the end of 2004. Another reason for the little participation of the workers of the opposition in rallies in Islamabad and Rawalpindi was imposition of Section 144. Small protest rallies were held in Rawalpindi’s Mareer Chowk, G.T. Road and a few in Islamabad because of the weather. MMA’s MNA Mian Muhammad Aslam led a few rallies in Rawat, Tarnol, Bharakahu etc where workers hoisted black flags and wore black arm-bands. The MMA staged demonstrations in Lahore at Muslim Town Morr on Ferozpur Road, Yateem Khana Chowk on Multan Road, Muslim Masjid at Lohari Gate, and Saddar Bazaar in Cantonment. Speaking to protesters at Muslim Town Morr, Mr Baloch said both the MMA and the ARD were holding meetings of their senior leaders within a couple of days to decide about a joint line of action against the army ruler. He said MMA activists would continue holding demonstrations on each Friday till the next line of action was decided. About three dozen leaders and workers of the 16-party Alliance for the Restoration of Democracy protested on Saturday against President Musharraf’s decision to retain his military office. The ARD protested in front of the Nicholson Road’s residence of the alliance’s Senior Vice-President Nawabzada Mansoor Khan. The Karachi chapter of the MMA held a rally at Lasbela Chowk where their supporters converged and after a few speeches the participants, holding banners and placards and MMA flags, formed a procession and marched up to Guru Mander where party leaders addressed the rally. Prof Shah Faridul Haque, President of Jamiat-i-Ulema-i- Pakistan and a central leader of MMA, said that Pakistan was created in the name of Islam and anyone who was talking against tenets of Islam had no right to live in Pakistan. Jamaat-i-Islami Secretary-General Syed Munawwar Hasan, who is also a central leader of the MMA, said Gen Musharraf was working in Pakistan on the dictates of the US and he had crossed all other rulers in pursuing what he called the anti-Muslim agenda. He said the day was not far off when the people would force him not only to give up the COAS office but he would have to step down even from the Presidency. Despite widespread rains and snowfall, the MMA workers held rallies in all big and small towns of the NWFP, demanding of Gen Musharraf to shed his military uniform and abandon his what they called so-called secular agenda. The alliance staged a protest rally in Peshawar, which was led by senior provincial minister Sirajul Haq, Minister for Religious Affairs Maulana Amanullah Haqqani and parliamentarians. The MMA activists and supporters took out a protest procession in Quetta in response to a call for observing the black day given by the MMA and ARD. They gathered in front of the Jamia Masjid and went to the Manan Chowk in the form of a procession where the MMA leaders delivered speeches. Peru declared a state of emergency in the southern Andean town of Andahuaylas where an armed group led by a radical former soldier stormed a police station and was holding 10 officers hostage. Seven persons were injured - two seriously - in a gunfight in the early hours of New Year's day yesterday after former army Maj Antauro Humala and around 160 followers burst into the station in the town, 560 miles from here, to demand the resignation of Peruvian President Alejandro Toledo. Mr Toledo cut short a beach holiday and summoned ministers and key officials to declare a state of emergency, which restricts citizens' rights and puts the area under the control of the security forces. The police and army reinforcements were sent in to restore order swiftly and Mr Toledo told a news conference that he was "in command of this operation and I hope it goes well". Major Humala earlier said by cell phone that some 800 police and 600 soldiers were massed and preparing to attack. "It all looks like it's going to be tonight,'' he said. He has vowed to resist until President Toledo quits. Maoist rebels have killed 17 security personnel and injured 18 others in two separate attacks, official sources said today. Five policemen were killed when Maoists attacked their vehicle with guns and explosives at Bangaun village in Kanchanpur district bordering India, early today, the police said. Six other policemen sustained injures in the attack. The slogan “Sharon is a traitor, death to traitors”, was sprayed on the walls of King George Street as the Jewish settler community gets increasingly vociferous against the Prime Minister’s “disengagement plan” calling for the evacuation of the Gaza Strip and four isolated settlements in the West bank. The unidentified girl from a settlement near Jerusalem refused to cooperate with the police calling the investigation against her “politically-motivated”. Other slogans like “Those who assist expulsion orders will be eliminated immediately,” and “We will kill for our land” were also written on the walls of the city. Peter Cook was picked today as the world’s most talented comedian in a poll of more than 300 comics, comedy writers, producers and directors on both sides of the Atlantic. The British comedian, who first rose to fame in the satirical show “Beyond The Fringe,” took the title ahead of “Monty Python” star John Cleese.